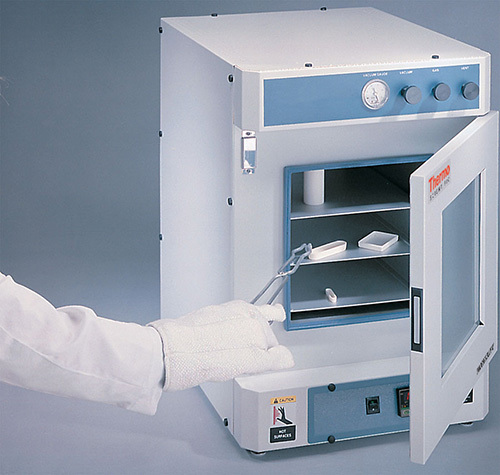 Thermo Scientific Lindberg/Blue M Vacuum Ovens offer digital electronic control, built-in over-temperature protection, and a fully flexible vacuum/purge/release system. They are ideal for a range of applications including drying, curing, outgassing, aging, process control and other applications requiring elevated temperature in reduced atmospheres or vacuum/purge with nonflammable and inert atmospheres. Alert: Ovens are not suitable for use with hazardous vapor. For use with nonflammable, noncorrosive inert gases only. Part Number 6718. This heavy-duty, white floor stand includes a door, shelf, latch, and lockable casters. It measures 28.2"H x 27.5"W x 30"D. It is specifically designed to work with all Lindberg/Blue M vacuum ovens (VO914, VO1218, VO1824 series). Part Number 118961. This kit includes NW fittings, centering rings, connectors, vacuum clamps, and hose to connect vacuum pump to oven. Part Number 305992H01. Includes (1) silicone gasket (red) for use with VO1218A, VO1218C, VO1218SA Lindberg/Blue M vacuum ovens. Maximum temperature limit of 250 degrees Celsius. Part Number 118977. Includes (1) Buna-N silicone-free gasket for use with VO1218A, VO1218C, VO1218SA Lindberg/Blue M vacuum ovens. For temperatures up to 150C only.